Ampara (Sinhalese : අම්පාර, Tamil : அம்பாறை) is the main town of Ampara District, governed by an Urban Council. It is located in the Eastern Province, Sri Lanka, about 360 km from the capital city of Colombo. This was a hunters' resting place during British colonial days (late 1890s and early 1900). During the development of the Galoya scheme from 1949 by the late Prime Minister D.S. Senanayake, Ampara was transformed into a town. Initially it was the residence for the construction workers of Inginiyagala Dam. Later it became the main administrative town of the Galoya Valley. In Sri Lanka, districts are the second-level administrative divisions, and are included in a province. There are 25 districts organized into 9 provinces. Each district is administered under a District Secretary, who is appointed by the central government. The main tasks of the District Secretariat involve coordinating communications and activities of the central government and Divisional Secretariats. The District Secretariat is also responsible for implementing and monitoring development projects at the district level and assisting lower-level subdivisions in their activities, as well as revenue collection and coordination of elections in the district. A district is divided into a number of Divisional Secretary's Divisions, which are in turn subdivided into 14,022 Grama Niladhari Divisions. There are 331 DS divisions in the country. Ampara Airport, also known Gal-Oya Airport, is a domestic airport in Gal-Oya in southeastern Sri Lanka. It is also a military airbase known as Sri Lanka Air Force Ampara or SLAF Ampara. Petikirige Dayaratna is a Sri Lankan politician and a member of the Parliament of Sri Lanka. He was elected to Ampara electorate in 1977 as a Member of Parliament from the United National Party. Abdul Majeed Mohammed Naushad also known as Mohamed Naushad Majeed is a Sri Lankan politician and a former member of the Parliament of Sri Lanka. Sri Lanka is divided into 9 provinces, which are further subdivided into 25 districts. Districts are further subdivided into Municipalities, of which are sorted into three categories. Each municipality is divided into Wards and wards into Grama Niladhari divisions. 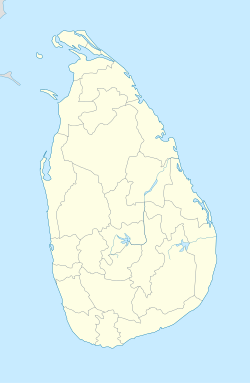 Ampara Electoral District was an electoral district of Sri Lanka between March 1960 and February 1989. The district was named after the town of Ampara in Ampara District, Eastern Province. The 1978 Constitution of Sri Lanka introduced the proportional representation electoral system for electing members of Parliament. The existing 160 mainly single-member electoral districts were replaced with 22 multi-member electoral districts. Ampara electoral district was replaced by the Ampara (Amparai) multi-member electoral district at the 1989 general elections, the first under the PR system, though Ampara continues to be a polling division of the multi-member electoral district. Nintavur electoral district was an electoral district of Sri Lanka between March 1960 and February 1989. The district was renamed Sammanthurai electoral district in July 1977. The district was named after the towns of Nintavur and Sammanthurai in Ampara District, Eastern Province. The 1978 Constitution of Sri Lanka introduced the proportional representation electoral system for electing members of Parliament. The existing 160 mainly single-member electoral districts were replaced with 22 multi-member electoral districts. Sammanthurai electoral district was replaced by the Ampara (Amparai) multi-member electoral district at the 1989 general elections, the first under the PR system, though Sammanthurai continues to be a polling division of the multi-member electoral district. Habeeb Mohamed Mohamed Harees is a Sri Lankan politician and Member of Parliament. Uduma Lebbe Mohamed Mohideen was a Sri Lankan lawyer, politician, Member of Parliament and deputy minister. Konduwattuwana Wewa or Kondawattuwana Wewa is an ancient reservoir located in Ampara, Sri Lanka. The reservoir lies on the Ampara – Inginiyagala main road, approximately 4 km (2.5 mi) away from the town of Ampara. The site with ancient Buddhist ruins which belonging to the Konduwattuwana reservoir area is a formally recognised an archaeological site in Sri Lanka. Samanabedda cave temple is an ancient Buddhist temple situated in Uhana, Ampara District, Sri Lanka. The temple lies on the Ampara – Mahaoya main road, approximately 6 km (3.7 mi) away from the town of Ampara. The temple has been formally recognised by the Government as an archaeological site in Sri Lanka. It is believed that the temple was built by king Saddha Tissa. Samangala Aranya Senasanaya or Samangala Forest Hermitage is an ancient Cave temple in Ampara, Sri Lanka. The temple is located west from the Kohombana junction of Ampara - Mahaoya main road, approximately 23 km (14 mi) away from the Ampara town. The monastery has been formally recognised by the Government as an archaeological site in Sri Lanka. The Sri Lankan anti-Muslim riots were the series of religious riots targeting Muslims beginning in the Sri Lankan town of Ampara on 26 February 2018, and had started in Kandy District by 2 March until its end on 10 March 2018. Muslim citizens, mosques and other properties were attacked by mobs of Sinhalese Buddhists, and mobs of Muslims attacked Buddhists Temples and Sinhalese citizens. The Government of Sri Lanka undertook a forceful crackdown on the rioting by imposing a state of emergency and deploying the Sri Lankan Armed Forces to assist the Police in the affected areas. The situation was brought under control by 9 March. Two fatalities and ten injuries were reported among Sinhalese, Muslims and Police. According to the police, forty five incidents of damage to houses and businesses have been reported, while four places of worship have been attacked. The police arrested 81 persons in connection with rioting. ↑ "Statistical Information". Ampara District Secretriat. 18 February 2014. Retrieved 27 October 2015.